The thermohaline circulation or THC is that part of the large-scale ocean circulation that is driven by water density gradients. The adjective thermohaline comes from ‘thermo-’ referring to temperature and ‘-haline’ referring to salt content, factors which together determine the density of sea water. For this reason, the THC is sometimes called the ocean conveyor belt, the great ocean conveyor, or the global conveyor belt. It mixes water between oceans, and transports energy (in the form of heat) and matter (solids, dissolved substances and gases) around the globe. Nathan Urban and Klaus Keller?, Probabilistic hindcasts and projections of the coupled climate, carbon cycle, and Atlantic meridional overturning circulation system: A Bayesian fusion of century-scale observations with a simple model, Tellus A 62 (2010), 737–750. 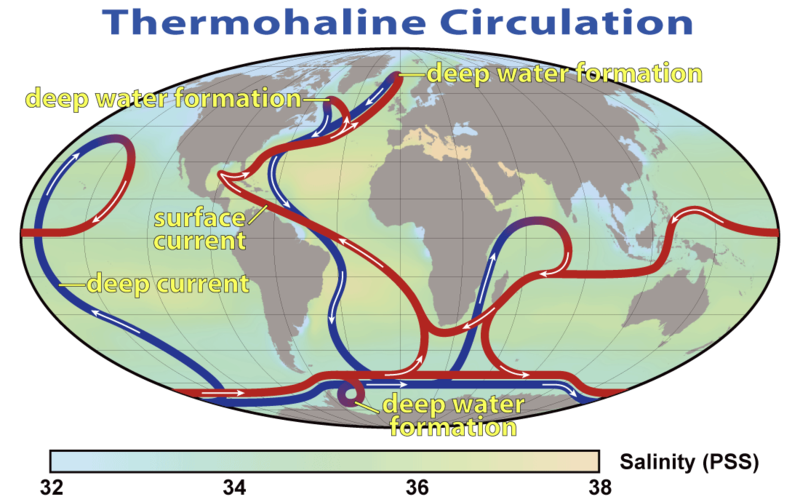 The term ‘thermohaline circulation’ is sometimes used to refer to the Atlantic meridional overturning circulation or AMOC. The term AMOC is actually more well-defined as it is difficult to separate the part of the circulation which is actually driven by temperature and salinity alone as opposed to other factors such as the wind. Conversely, temperature and salinity gradients can also lead to a circulation which does not add to the MOC itself. Stefan Rahmstorf, Thermohaline ocean circulation, Encyclopedia of Quaternary Sciences edited by S. A. Elias, Elsevier, Amsterdam 2006. The following paper gives a conceptual theory for the AMOC emphasizing the role of diapycnal mixing in driving the AMOC strength, and Southern Ocean wind stress in determining stratification in the Atlantic basin. Maxim Nikurashin and Geoffrey Vallis, A theory of the interhemispheric meridional overturning circulation and associated stratification, Journal of Physical Oceanography (2011), submitted.